Harvey's Havoc On Schools; U.S. Hispanic Enrollment Soars; A Controversial DeVos Hire : NPR Ed New demographic figures on enrollment; hundreds of thousands of students in limbo while schools recover from Harvey; and more education news of the week. 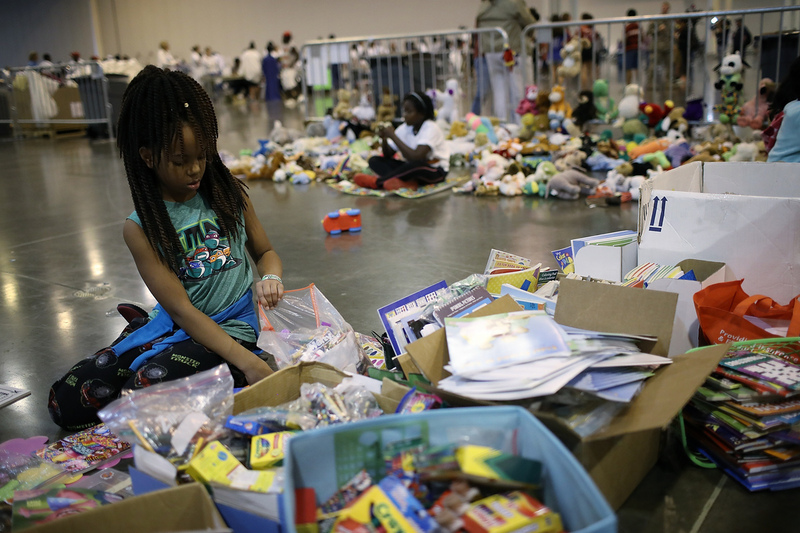 Schools are closed and thousands of Houston-area families are living in temporary shelters as the city starts the recovery process after Hurricane Harvey. In the Houston Independent School District, the first day of school for 218,000 students, originally planned for Aug. 28, has been pushed back to Sept. 11. Assessments of school buildings are underway, with damages ranging from minor water intrusion to major flooding. Staff will begin coming back to work next week. In recognition of the devastation many families are facing, Superintendent Richard Carranza announced that the Houston ISD has received authorization from the U.S. and Texas departments of agriculture to provide all students this school year with breakfast, lunch and dinner for free. The number of students enrolled in U.S. schools from kindergarten through college reached 77 million in 2016, the U.S. Census Bureau reported. That is an increase of 9.9 percent over the past two decades. Far outpacing any other group, the number of Hispanic students has doubled in 20 years. Hispanics now make up 22.7 percent of all students. Finally, more students are attending college, and of those, more are going full time. Three out of four undergraduates now attend full time. This should be good news for graduation rates. Julian Schmoke Jr., a former official at West Georgia Technical College who previously worked for the for-profit DeVry University, will join the Department of Education as the head of the Student Aid Enforcement Office. In a statement on the hiring of Schmoke and two others, Education Secretary Betsy DeVos promised "stronger consumer protections for students, parents and borrowers against 'bad actors.' "
But the move has worried critics that the Trump administration may be easing up on investigations of predatory actions by colleges. The Obama administration created the enforcement office in 2016 primarily to respond to charges of fraud and misleading students, mainly by for-profit institutions. For example, DeVry Education Group, where Schmoke worked from 2008 to 2012, settled with the department and the Federal Trade Commission last year over allegations that it had incorrectly reported job-placement rates. The $100 million payment was used to refund DeVry students and forgive former students' loans and outstanding payments. The 2017 PDK Poll of public attitudes toward public schools found that less than half of adults, 42 percent, say performance on standardized tests is a highly important indicator of school quality. Large majorities said they want schools to focus on job skills and interpersonal skills as well as academics. Overwhelmingly, people named a lack of financial resources as the biggest problem facing the schools. And about half would give their local schools an A or B grade. The number of elementary and secondary teachers who are black, Hispanic, Asian, Pacific Islander or Native American has more than doubled since the late 1980s — faster than the number white teachers and faster than the rate of nonwhite students, according to a new report from the nonpartisan Learning Policy Institute. The authors call this an "unheralded victory." But, the report says, these increases have been undermined because nonwhite teachers, particularly men, are leaving the profession a little more quickly than white teachers. In the most recent year covered by the survey, the turnover rate was 18.9 percent for members of minority groups and 12 percent for white teachers. The data show that at the beginning of the 2003–04 school year, about 47,600 teachers from those minority groups entered teaching; however, by the following year, 20 percent more — about 56,000 — had left teaching. One major reason for leaving reported by teachers: poor administrative conditions. Teachers who are members of minority groups are two to three times more likely than whites to work in schools that have concentrations of poverty. Deep Springs College, a 30-student, private institution in central California, is known as a place where students combine cattle ranching with hard-core philosophy seminars. Tuition is free. Now in its hundredth year of operation, the college will begin to accept women, over the objections of some members of its board. With this move, just a handful of men-only colleges remain, mostly religious institutions, as well as Morehouse College in Atlanta and Wabash College in Indiana. Deep Springs President David Neidorf told NBC News that he welcomes the change. A previous version of this story incorrectly said that Deep Springs College was being ordered by a court to accept women; the college had been engaged in a legal battle to become coeducational, with some of its trustees objecting.